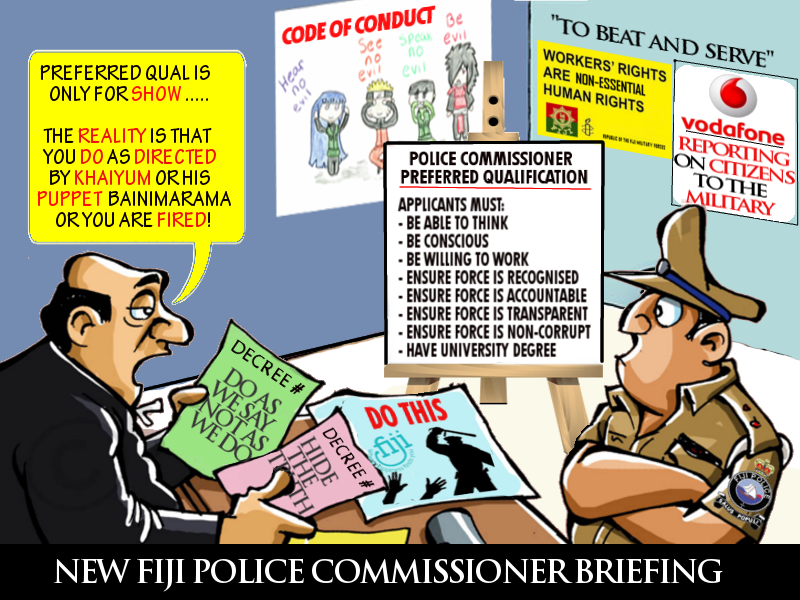 Fijilive reported that applications for the new Fiji Police Commissioner post closed today. So what can the people expect from a new commissioner? Not much, given Bainimarama and Khaiyum's record of appointing people who do whatever they want - legal or illegal, or the person gets fired. This makes the appointment of the new CEO for Air Pacific/Fiji Airways rather interesting, especially after the CEO's published comments that highlight Khaiyum's stupid interference in the proper management of the airline, his arrogance and corruption. Yes, we await Khaiyum's tantrum and reaction to the CEO's comments. Without an independent Commissioner of Police we can't expect too much change from the rank and file. This suggests that crime and human rights violations by the police and military will continue. Sources report that cases will not be solved as quickly or as effectively as they should and that staff moral will remain at an all time low.